Have you ever wondered what God’s to-do list looks like? I’ve always prided myself on my ability to succeed. Whether it was in school or merely making new friends, I continuously find myself determined to get things done. I grew to love challenges because they made the outcome all the more exciting. If there was ever a dilemma – I would be there, standing with my pen and paper ready to face it (with the help of my to-do list). My bookshelves are filled with notebooks which are filled with my lists. I even have special notebooks that are specifically made for to-do lists. Most of them even have my name engraved on the front (kinda like a Bible). I might have minor OCD, but I also just truly love how I organize things. To-lists can be great. They can help you keep track of deadlines, hit goals, and stay productive. They can teach you time management and constructive planning, all while keeping you organized. But if your to-do list has your name on the cover and not Gods you are headed for trouble. The thing about to do lists is they can consume your every minute. You pre-plan when you’re going to shower for goodness sakes. But what’s the thing about God that we all know so well? He thrives in the unexpected. Whether it’s a good thing like meeting a new friend because you stayed around to talk after church, or a negative thing like facing an illness – He is there. Over the years I have come to the conclusion that God despises our to-do lists. Although many of things on them are great and used for His glory, I bet He often time finds them ridiculous. 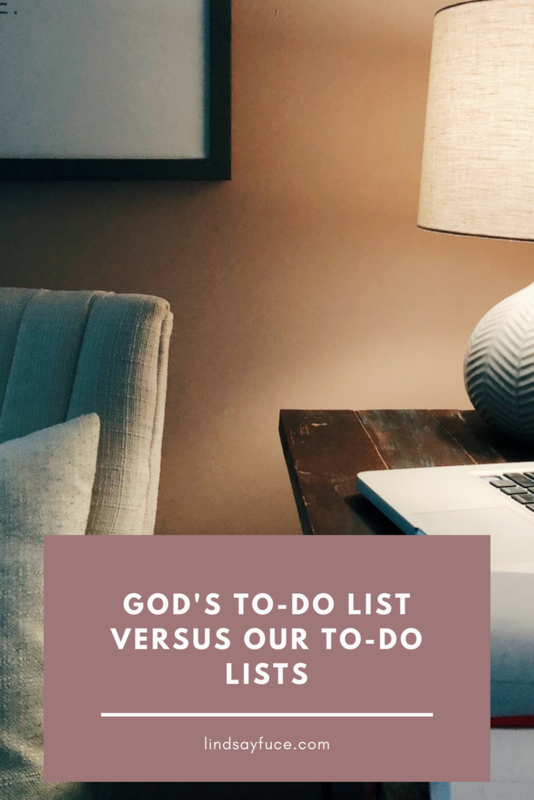 The problem with our to-do lists is they often place the two items on God’s to-do list far down the list. For some, including myself, I sometimes even forget to put those items even on the list, let alone at the top. I was working an impressive job, taking 22 credits online, was training for a marathon which was putting me in the best shape of my life. To me, I was performing at an all-time high in all aspects of life. And what was keeping it all together? My to-do list that broke my days down into 15-minute increments. Well, after a few months of “living my best life” I got extremely sick. To spare you the details, I could barely walk and using my brain was really difficult. I spent months in bed, unable to really “accomplish” anything. My to-do lists were empty. I even started added crazy small things to them like “taking a shower” or “making a smoothie,” just so that I would feel a sense of accomplishment. But while I was resting, God was working. God brought me to a place of brokenness that no to do list could fill except for His. And you know what? He has delivered every single day since then. I’m not perfect and I will never come close. I’ve had days where I’ve completely nixed #2 and days where I have been mad and confused at #1. But what stands tall in everything is step #3. When I was sick, I watched as I was unable to do anything yet He continued to do everything. The cool thing about God’s to-do list versus mine is that there’s grace for not completing His. Often times if I don’t complete things on my to-do list there are huge consequences. Like not getting paid, or even worse, getting fired. But with God, it’s simply a new day. Because each day His mercies are new and so are our to-do lists. I still use a to-do list. It’s not broken down by the hour now, but by priority. I’ve scratched some items off the list and added a few others. There’s no “take a shower” or “spend 1.5 hours with a person” on there. Followed by things I want to accomplish throughout the day. But those items are always at the top, and most days they completely dictate how my day goes. Having a to-do list is completely fine, and something I recommend to most. It helps me stay motivated and moving, but greatest of all, it helps me remember WHO is in control and WHO I am living for. If God Is So Powerful, Why Doesn’t He Reveal Himself To Us More?